Lisa and Loren Skyhorse began making saddles over 43 years ago in northern California. They now call Durango, Colorado their home. Their passion for horses and custom saddlery runs deep. They are both avid riders and have ridden horses all over the world, including Africa, Mongolia, Peru and the Altai mountains in Southern Siberia. Lisa and Loren have always run their business with the utmost integrity. They remember when a person's handshake and word were their bond and continue to live and do business by that code of honor. Below is a short explanation of how they came to produce Skyrider. We hope that knowing the evolution of Skyrider will be helpful in your decision to try one. In 2010 Lisa and Loren set out on a venture to design and construct a saddle that was affordable, yet encompassed all the qualities of their nicest custom saddle. As a result of their effort, the SKYRIDER was born. It wasn't easy, however. There were several prototypes built and tested before deciding on just the right design. Only after Lisa and Loren were completely satisfied with the durability of the saddle and its comfort for both the horse and rider, would they offer it to their clients. It was decided that for the Skyrider to be a partner with CUSTOM SKYHORSE SADDLES, this saddle would not offer any 'options'. Instead, the SKYRIDER would be a consistent structural design that would work beautifully on 95% + of all the pleasure horses .....and be versatile enough to move from horse to horse.....eliminating the frustrations of the horse owners. All the owner needed to do was perhaps alter the saddle padding from horse to horse. The wide-set tree of the SKYRIDER achieves a perfect fit with the saddle pad/blanket changes! To accommodate the modern pleasure horse we have widened the bars of the tree to 7" and, most importantly, changed the bar angle to 93 degrees. With appropriate saddle pads, this design fits over 95% of all pleasure horses today.....and will be a great saddle to move horse-to-horse in your barn!! ALL Skyriders are built on a hand-made cedar wooden tree with the highest grade leather. ALL Skyriders would use stainless steel hardware. ALL Skyriders have the comfortable 1" closed cell foam in the seats. ALL Skyriders come with the Nickel SKYRIDER conchos. ALL Skyriders come with the proprietary Lightning-bolt stamping. ALL Skyriders use only genuine sheepskin to line the skirts. And ALL Skyriders come with industry leading.. ...7 day trial period. Lisa and Loren realized that if they were to personally build every Skyrider, they'd price themselves out of the market and their 'affordable' saddle would no longer be quite so affordable. They decided to gather a team of proven saddlemakers to help them bring their Skyrider to life. Located near their home in Durango, Colorado, they personally trained their team to construct each Skyrider with the care and detail they would expect from themselves. Quality would absolutely not be compromised. Lisa and Loren are, in fact, the Skyrider 'quality control' division. Loren puts the finishing touches on every Skyrider we sell. No saddle will leave their shop unless it meets Lisa and Lorens highest standards. 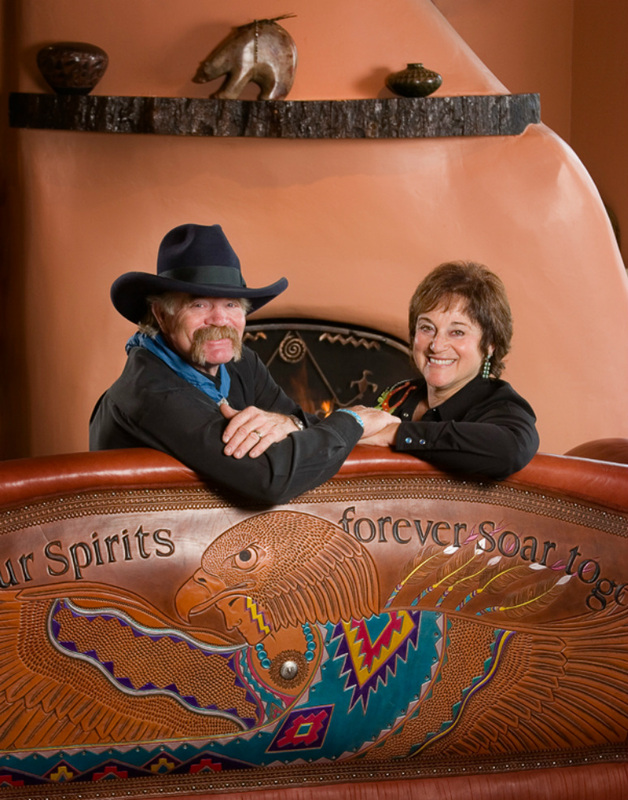 *Skyrider comes with the backing of two of the finest saddle makers in the world; Lisa and Loren Skyhorse. *Only the finest, most durable materials are used. *The design is a result of 40 years of expert saddle making experience. *You have a full week to test ride your Skyrider to assure a comfortable fit for both you and your horse, so your financial risk is minimal.